When Dutch amateur racer and oil-man Klaas Zwart bought Ascari in the late 1990s he had very ambitious plans for the small manufacturer. Up until then the British company was on the verge of breaking into the supercar market. The BMW engined 'Ecosse' was launched in 1999 but was only the precursor of bigger things to come;a proper Le Mans racer. Instead of starting with a clean sheet,Ascari used the Lola T92/10 Group C racer as the basis for the new Ascari. Originally designed to the 3.5 liter Group C regulations almost a decade earlier,the Lola actually formed a logical basis. The chassis design and suspension would still be completely legal and the Judd V10 engine was also still in use,be it in a slightly larger,4-liter form. What needed most attention was the aero package,which had to meet the latest LMP regulations. The biggest difference was the conversion from a coupe to an open body. 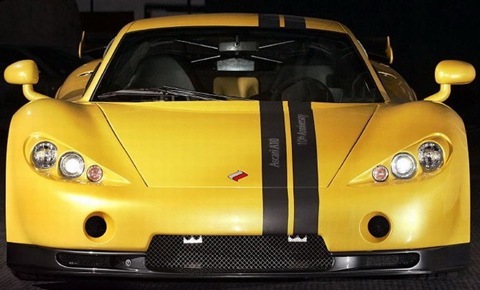 The new Ascari racer was dubbed the A410 (for 4-liter V10) and was debuted at the Silverstone 500km race in May of 2000. Particularly the flat nose revealed the car's Lola T92/10 roots. It was difficult debut as gearbox problems prevented the new Ascari from taking part in the race. The team had earlier failed to make it to the official Le Mans test and subsequently were not invited for the race. In the following the A410 was further developed and raced in various rounds of the FIA Sportscar Championship. A second during qualifying at Brno showed that the car definitely had potential. The progress continued in the next year when Werner Lupberger and Ben Collins finished second in the Sportscar Championship round at Monza. For Le Mans a second example was completed and both A410s were accepted. After qualifying 18th and 22nd on the grid,neither car managed to make it to the finish. In late August there was finally success for the Ascari team as Lupberger and Collins won the Donnington round of the FIA Sportscar Championship. For the 2002 season the cars were renamed 'KZR-1' and shipped to North America and raced in the Daytona 24 Hours and the Sebring 12 Hours. A sixth at Sebring for the second chassis was the best result. Only one car was accepted in the 24 Hours of Le Mans,which again ended prematurely for the Ascari team. In 2003 the KZR-1 was raced twice more in a FIA Sportscar Championship round,scoring a second at Monza. It was the end of a brave but ultimately unsuccessful effort. A manufacturer the size of Ascari would always face an uphill battle against the likes of Audi,Dome or even Courage. Ascari returned to the production of road cars. Dubbed the KZ1,an all new Ascari was launched that same year and would form the basis for a GT3 racing car. The Ascari team turned their attention to fielding Klaas Zwart's fleet of Formula 1 cars in the EuroBOSS series,with considerable success. The first of two Ascari A410s built,chassis 001 made its first appearance in the 2000 Silverstone 500 km race. It was used throughout the 2000 and 2001 seasons and received regular updates and upgrades that greatly improved the performance. At Le Mans in 2001,it was driven by Werner Lupberger,Ben Collins and Harri Toivonen. It was qualified in 18th position on the grid but failed to finish the race with a fuel feed problem. Later in the year,chassis 001 was driven to the types only victory. In 2002 and 2003,it was raced as the Ascari KZR-1 but with little success. It is seen here during the Spa round of the 2001 Sportscar Champsionship where it started the race in fifth and finished a credible fourth.